Around the office, most of us couldn’t tell you where the printers are anymore. The company has done everything they can to provide us tools to not need a piece of paper. Note are written on iPads or Android Tablets or typed into our notebooks. That is work, most of our home lives are another thing. At home, there is still the need to give other people pieces of paper with printed info on them. And there is the occasional need to scan documents given to a family member into our iPads for later reference. The majority of the HP printers produced this year carry Air Print from Apple so you can connect your iPad either directly or over the household wifi network. Either connection means the two talk to each other naturally through any app that supports the Apple feature. 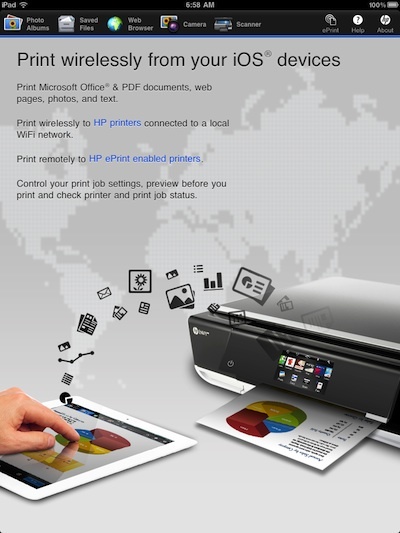 For slightly older HP printers or new without Air Print, the solution is the HP ePrint app. The universal free app is a central point to print pictures, documents and Web pages out of the iPad and if your HP printer scans it accepts the scan into your iPad! It’s listed as ‘Home and Biz’ but we can only speak to using it in our homes. 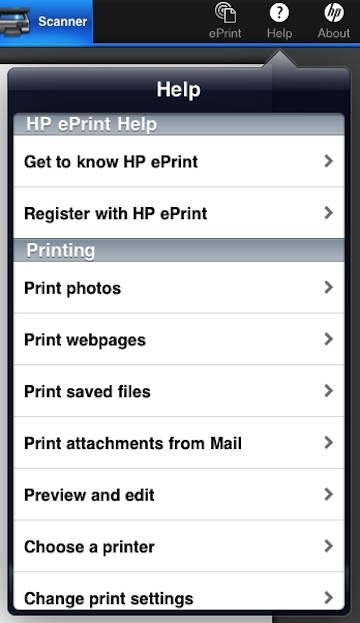 Usage of the HP ePrint app is about as self explanatory as it can be. The latest update brags of the ability to print Microsoft Word, Excel and Powerpoint as well two sided printing if the HP Printer you have supports it. Launch the app and choose where the document is to print from the options across the top of the screen. Both the Photo Albums and Saved Files lets you find items on your iPad to print. Select the option that matches the document type and tap through to the document you need to print. For photos to HP Photo paper, it worked very nicely to get a print of a images we had touched up on the iPad. Documents are now not only simple text that you created on your iPad but also Microsoft documents that you created or edited too. If you knew your client had a HP Printer, the HP ePrint app might be handy to edit the contract up to the last second then hit print for the parties to sign. Printing a Web page makes a few of us uncomfortable with the wasted paper when saving to a PDF would be more ‘responsible’. But, the reality is there are times when you need a print copy of a page you viewed, maybe to mark up with you non-digital highlighter… HP ePrint has you covered to browse to a Web page in the app then hit ‘Print’! The Print Preview is a nice feature to make sure your actually able to print the Web page as you expected in case the site has any limitations to what is seen/printed. 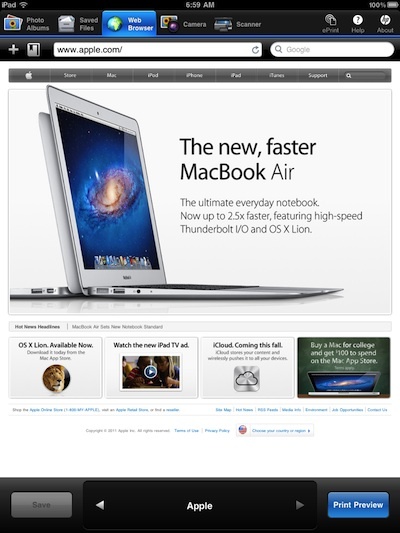 The ‘Scanning’ feature works very much like the desktop software does. Choosing it will allow a full page scan to come in from the HP Printer/Scanner your iPad is connected to. When you have a preview image on the screen, drag the sides down to the exact area of the page your interested in having a scan for and HP ePrint will scan/deliver just that part in a final higher rez scan. 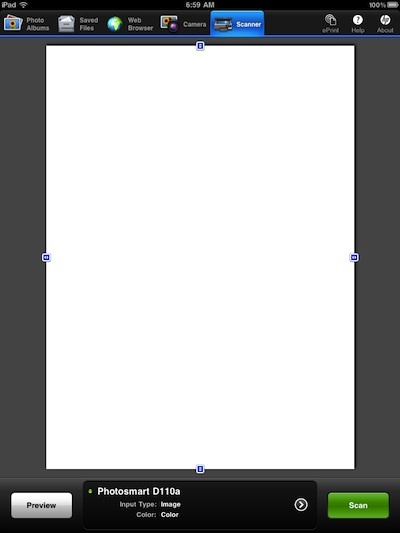 A nice feature when all you need is a small part of the page so you not storing a full page scan when you don’t need it. If you run into any issues or questions, the built-in “Help” covers all the features and set up of each to fine tune to your needs or network.